This is the current default expiry page. I'd like to tart it up. I've used the following technique for so long, I've forgotten what it used to look like to drive me to this solution. Ultimately, you end up with a similar result, but you really can customise it to behave however you like. Under Shared Components -> Security -> Session Management, you'll find the Session Timeout URL attribute. Here we can specify what page should be opened when the application times out. If I use the following, it will open the login page just as it normally would have, but also include a REQUEST parameter, with the value "TIMEOUT"
Where TIMEMOUT is the literal string we provided. Here I've used it to conditionally display a region that uses the Alert template. 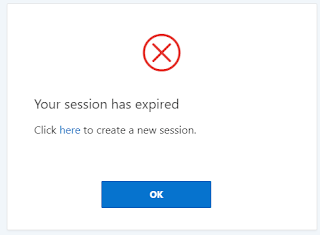 The only trouble is, when your original session times out, Oracle initiates a new Session ID - which will also time out. Then, when you press the login button, you'll just see this. Your login page has timed out! So we could extend the region I added by providing a link to re-open the login page, forcing a new session. Click <a href="f?p=&APP_ID. ">here</a> to log in. 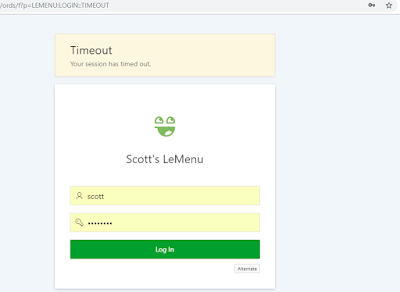 And add a condition to the original Login region to exclude when the timeout message is being displayed, forcing the user to click the link to re-open the page, thereby initiating a new session. I use this SQL expression to test the opposite, since the request value may be null. class="t-Button", since buttons are easier to tap. Or just add a declarative button to the region. 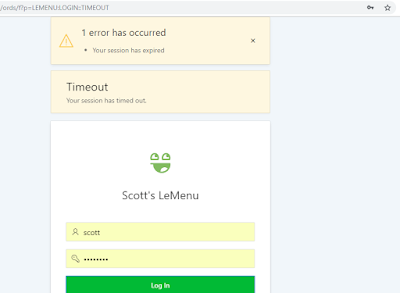 Or you could just set your Timeout URL to redirect to a completely different page, where the Authentication page attribute is 'Page is Public'. Nothing too exciting, but I do like the options a REQUEST parameter can offer - transmitting information with no need for a defined parameter name. This is one of a few ideas shown in this presentation, from slide 22.